Finland was set to host the 1940 Summer Olympics in Helsinki. 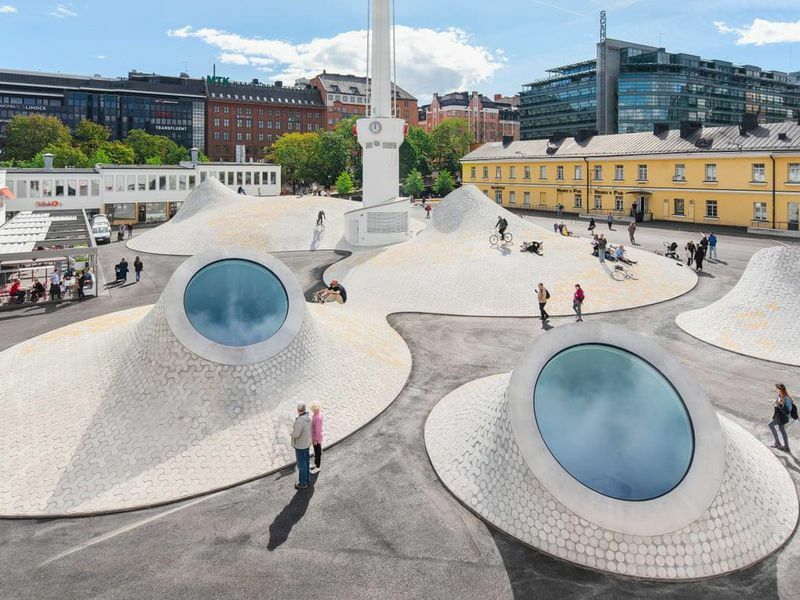 Local authorities in Helsinki granted three young architects permission to design one of the many temporary structures. The structures would would welcome visitors to the Games. The result was a functionalist shopping center. It had offices and restaurants. It also had a movie theater. The building soon earned the title of Lasipalatsi, or the “Glass Palace.” It was encased in seemingly endless window panels. On September 1, 1939, German forces invaded Poland. This began World War II. It also rescued Lasipalatsi from being torn down. That's according to Michael Hunt writing for Artnet News. The Olympics’ took a wartime hiatus and Finland saw post-war financial difficulties. Both of these events stopped Finnish officials from tearing down the Glass Palace and replacing it with a new structure. One that would have been designed specifically for the rescheduled 1952 Helsinki Olympics. Lasipalatsi endured. It became a popular local landmark. By the 1980s, the structure had become an unwelcome strain on the city’s finances. Today, Lasipalatsi is beloved. It is profitable once more. This is thanks in large part to Amos Anderson. He is an art patron and newspaper publisher. He created the $60 million Amos Rex Museum. It is a futuristic art bunker. It is nestled beneath the Glass Palace. It opened to the public in August. 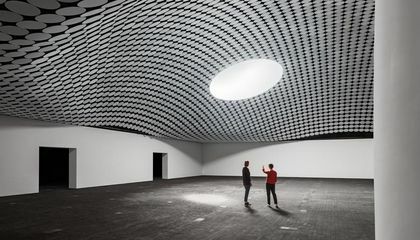 The new museum was designed by JKMM. It is a Helsinki architecture firm. That's according to The Guardian’s Oliver Wainwright. Sprawling underground galleries stretch across 23,350 square feet. Domed skylights are covered in simple geometric patterns. They dot the landscape. They pour light down to the exhibition spaces below. The bulk of the museum rests below a square beside Lasipalatsi. It once housed Helsinki’s main bus station. That's according to Giovanna Dunmall writing for Wallpaper*. Today, all traces of this bus station have vanished. It was replaced by the sweeping curvature of the Amos Rex’s mountainous skylights. Jaaksi adds that Lasipalatsi was “very well built.” This is despite the fact that is was meant to be a temporary structure. That's according to an interview with Wallpaper*’s Dunmall. The Glass Palace's eclectic charm remains. Inside there are salmon-colored columns next to glass light fixtures. These jut out from red and blue ceilings. Outside is Lasipalatsi’s one-time chimney. It stands tall amidst the clustered skylights. It looks more like a lighthouse than a rudimentary ventilation system. One of Lasipalatsi’s most notable features is the Bio Rex movie theater. It closed a decade ago. But now it has been revived in splendid fashion. It has 590 seats that are covered in vivid red fabric. It has circular ceiling lights that hover above the auditorium. It’s as if they are UFOs. They emit a steady glow to guide viewers across the space. The theater serves as the Amos Rex’s entrance. It provides passage to the galleries below. That's according to Artnet News’ Hunt. The museum draws on foundations left by Amos Anderson. He was an art lover. His collection of 19th- and 20th-century Finnish art forms the bulk of the institution’s permanent collection. The Amos Rex was once called the Amos Anderson Art Museum. It operated out of its patron’s former home. This was prior to construction of the new space. By the 2010s, the museum was beginning to outgrow the house. It acquired the Lasipalatsi and transformed its surrounding grounds. The innovative 21st-century structure offered the ideal solution for both institutions’ organizational woes. Oddly, Amos Rex’s inaugural exhibition makes little use of the gaping skylights overlooking its galleries. Instead, curators have opted to highlight the subterranean nature of the museum. They blocked natural light to present an immersive digital experience. It was created by Japanese art collective teamLab. The show is entitled “Massless.” It rejects materiality in favor of “dissolving the notion of mass” and creating an otherworldly environment. That's according to teamLab’s website. “Massless,” runs through January 6, 2019. It is accompanied by a selection of post-impressionist art collected by Sigurd Frosterus. He is a Finnish architect. He is also an essayist and art critic. Future exhibitions will feature works by Amsterdam collective Studio Drift and Belgian surrealist René Magritte. Kai Kartio is head of Amos Rex. He tells Metropolis Magazine′s George Kafka that the new structure is equipped to handle large-scale installations like “Massless.” It can also handle more traditional exhibitions. I think that the most appealing thing about a museum being underground is that it is underground. Inside of the museum it probrably feels different in there, and maybe cold. I think that there more appealing because you can do a lot more stuff then what you can do with a building and you don't have to worry about people having a fear of heights when they go up there so they can enjoy the museum. one thing that I that one thing could be troubling is that it might get too hot so they probably should put fans or ac down there. I think that the most appealing thing about an underground museum is that it's underground. I cant think of any other museum that is underground. It is a unique museum even if it wasn't underground too. It would be cool to go too these kind of museums and recently I went to the civil rights museum, which was great. I hope I can museum in real life. This place sounds like it is really well designed. The art semes really cool I would love to go one day.